Soul Calibur is a major fighting video games series, which started in 1996. It takes place in an historical fantasy setting, with many of the main characters wielding magical melee weapons. 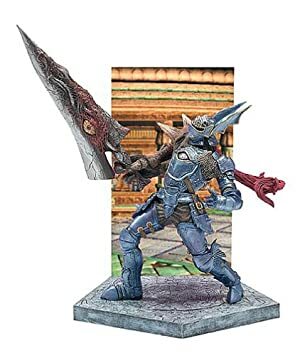 The plot is driven by the evil influence of the cursed sword the Soul Blade, which can be opposed by the magic blade Soul Calibur. 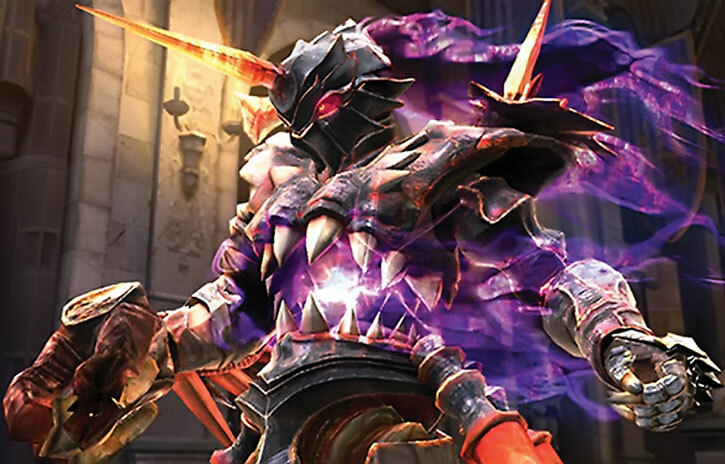 Nightmare’s THE villain in Soul Calibur, as the manifestation of the Soul Blade (the evil blade). He’s also a good mid-level mystical threat who could even be used in more modern campaigns. Particularly useful for being dropped in at anytime as the ancient evil sword has the ability to posses people and make them become his servants to help him gather souls. Other Aliases: The Azure Knight. Group Affiliation: occasionally recruits suitable minions. Height: 5’6” Weight: 212 lbs. 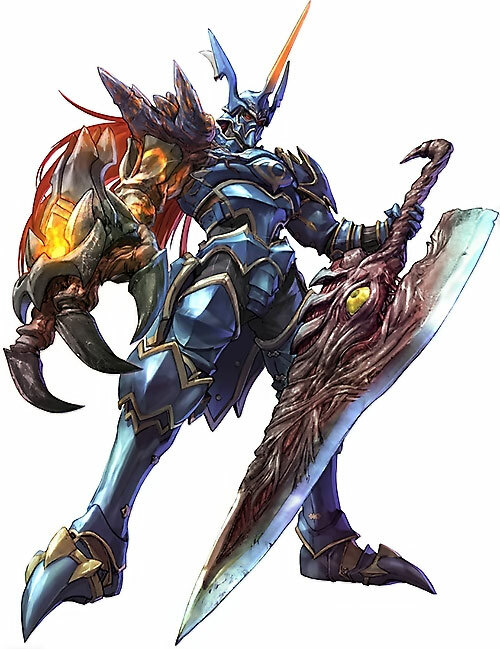 The Soul Edge, when it takes a physical form, is pretty damn scary. It has slaughtered an almost incomprehensible number of innocent people. Its evil can never truly be destroyed, only dispersed. It persists to plague mankind with its harvest of souls and sheer bloodlust. Besides being a formidable fighter it is quite cunning, having existed since ancient times. It is also quite skilled into manipulating others into doing its bidding. Basically it’s the stuff that nightmares are made of (pun intended). 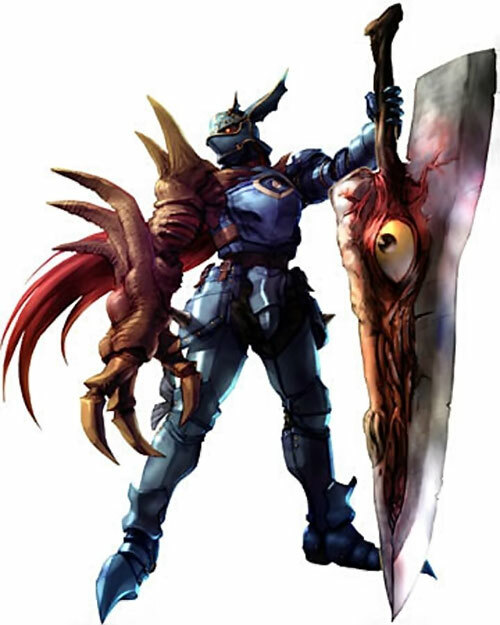 Nightmare appears as a set of mutated armor. 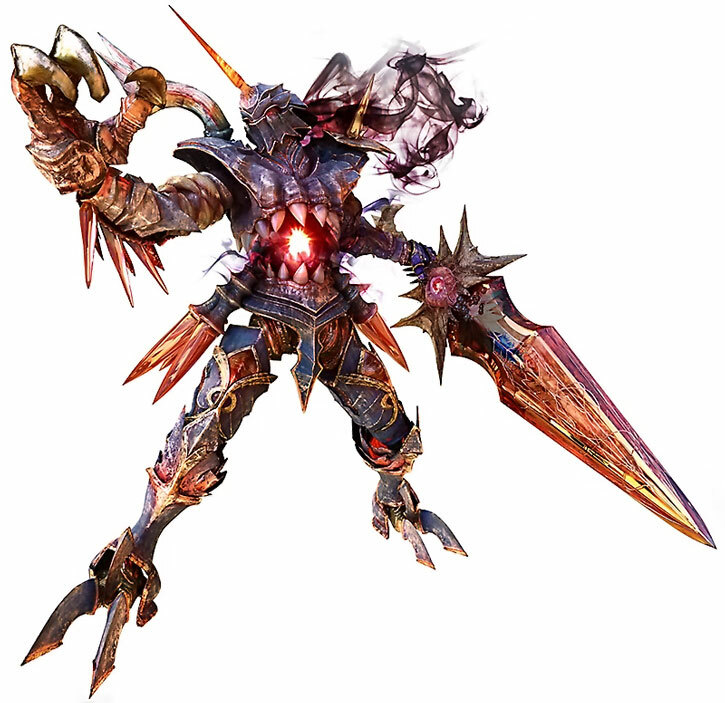 It has two giant monstrous fingers and a horn on its helmet and glowing red eyes. 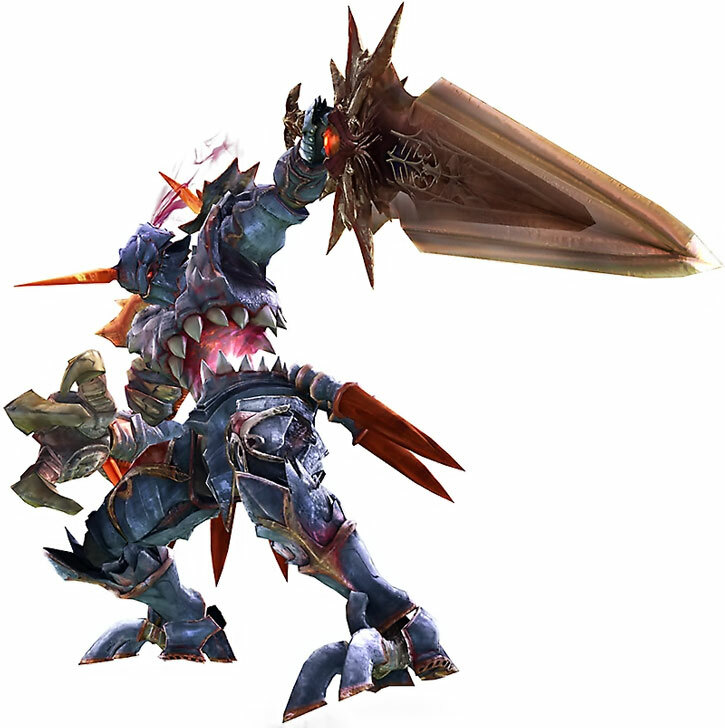 The armor usually takes on an azure hue which’s how it gained the nickname the Azure Knight. 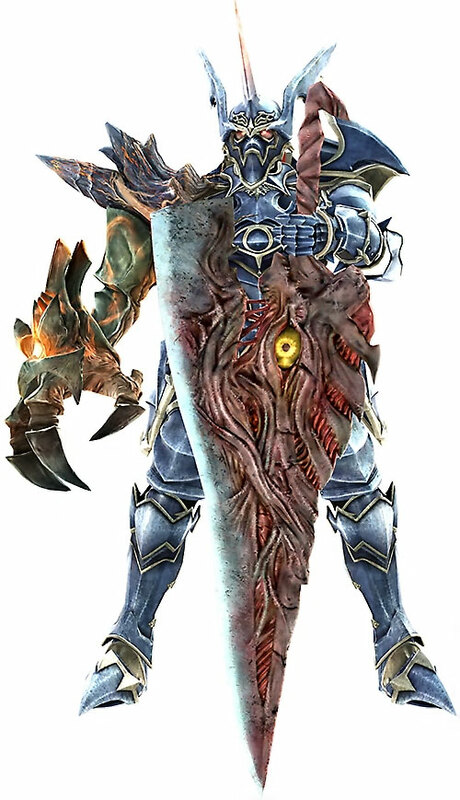 The Soul Edge looks particularly unnerving as it is a giant mutated sword with a giant creepy eye in the middle. The Night Terror form is even larger further mutated and has wings. Nightmare is an ancient, unspeakable evil. It hungers to devour enough power to take over the world, through harvesting souls and spreading destruction. The real scary part is that the sword has never been stupid or single minded about it. If it’s destroyed or faces a set back it knows it is ancient and unkillable. So it will just sit back and patiently bide its time until it gets another opportunity. It’s also smart enough to recruit followers through its various manipulations. Furthermore, the Soul Blade is occasionally able to outsmart potential foes through playing on their hearts’ desires and emotions. Iron Nerves, Languages (likely many, having existed since ancient times), Lightning Reflexes, Schtick (Goonbane, Fists of Fury). None, but it usually recruits followers through various manipulations in each incarnation. Attack Vulnerability (-2 CS RV against attacks against the eye of the sword), Attack Vulnerability (-1 CS to both OV and RV when fighting against the Soul Calibur). Soul Edge [BODY 07, EV 07, R#00]. The sword can choose to do mystical damage as instead of physical. It has also manifested a number of minor powers that are more suited to left up to the plots demands. (Treat as Omni-power: 08). 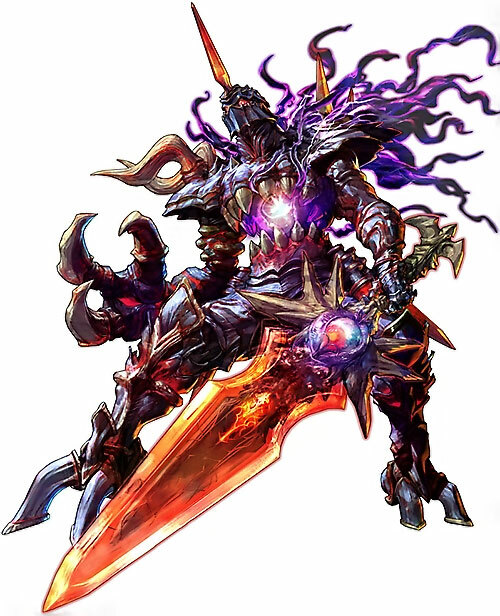 Night Terror is an even more complete form of the Soul Edge. It’s bigger, scarier and meaner. Add: Growth: 02, Flight: 02, and Laser beam: 04. Flight is winged and generally pretty clumsy and up Str and Bod to 08, but reduce Dex to 06. In SC4 he also demonstrated Flame Projection: 08 with area effect. It’s unlikely the ending will happen, but the sword does seem attuned to the element of fire so its entirely possible that it would have some sort of FP perhaps with the seriously marginal limitation. Speculative, but highly likely. The sword has existed since ancient times and never seems to have problems with the language barrier. A bit tricky. The sword essentially cannot be destroyed (or at least its evil essence cannot be destroyed). If one that it inhabits perishes then the sword can choose to extend it’s Invulnerability to the subject, although it typically doesn’t do this, since fallen possessed victims have usually outlived their usefulness. It has been known to do this in the case of Siegfried if it thinks that the subject is particularly useful or at least easily manipulated to its whims. If the sword is destroyed (resistance attribute reduced to zero) then the sword can automatically make an Invulnerability check as normal. If it achieves any positive RAPs then it can remain in its physical form or at least choose to inhabit something suitable nearby (it once inhabited Siegfried’s armor that he cast away after breaking its possession). If no positive RAPs are scored then its evil aura is dispersed all over the world in the form of tainted metal shards. The shards generally bring evil and misfortune, but aren’t terribly powerful generally speaking, although on a few occasions enough shards gathered together with enough evil energy can cause people to go insane and start killing each other. Usually the storyline dictates that someone is foolish enough to gather enough shards and the sword eventually gathers enough power to either take on a physical form of its own or at least possess a suitable host. Once it has a physical form it will go on a bloodthirsty rampage and start harvesting souls. In addition to normal HP rewards like a normal villain it also gains an additional bonus HP for every victim it kills. Such HPs can be spent normally on character advancement or push attempts and the like. The sword is not stupid or single minded either. It does on occasion recruit suitable agents to manipulate in furthering its goals. Can only be used when the sword’s physical form has been destroyed and it needs to find a suitable host. Typically what the sword does is Mind Probe the victim, learn what their deepest, darkest secrets and desires are and make a persuasion attempt to soften the victim up a bit. The sword will use any outright lies or trickery and attempt to twist the truth so that the victim will think that harvesting souls for the sword is mutually beneficial normal attitude adjustments still apply. In Siegfried’s case the sword promised that if Siegfried harvested enough souls it would gain enough power to resurrect his father. Any positive column shifts achieved by a persuasion attempt then carry over to the next more brutal attempt of Personality Transfer. Source of Character: Soul Calibur video games. Helper(s): roto13, Sébastien Andrivet, Darci.